EBED needs support from people like you to continue to work towards our aims and objectives. There are a number of ways you can help, for more information on any of them, please click on the links below. Why not arrange a charity event and donated the proceeds to EBED? We can supply you with everything you need, including leaflets and information about the charity for people coming to your event. Please contact us and let us know about what you are planning, and we will do all we can to help. EBED now has a charity account on JustGiving, which you can use to collect donations for us from your fundraising efforts. Go to https://www.justgiving.com/englishbridgeeducation-development to view our profile and start fundraising for us. If you are involved in the running of a Bridge Club, there are many ways you can help to support us through bridge sessions. The EBED Simultaneous Pairs are a fantastic way to get involved - any club whether they are EBU-affiliated or not can host a heat or multiple heats across one week in the Spring and another in the Autumn. All proceeds from these events are donated to EBED. 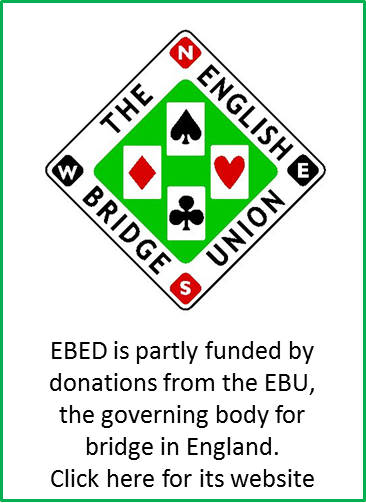 Clubs can also choose to support the future of bridge by donating the table money from a special session to EBED. EBU-affiliated clubs can maximise their donation by choosing one session per year to be exempt from UMS charges for a charity event. You could combine this with a cake, produce or second-hand book sale, or any other way to raise money - be imaginative and please do let us know about your plans so we can help you with your much-appreciated fundraising efforts. We have an excellent team of Trustees who guide our work as a charity. Their experience ranges from Financial Management to IT to Education,and they use that experience to assist our team of staff in the office at Aylesbury. We are always keen to hear from anyone who would be interested in becoming a Trustee of EBED, so please e-mail Donna Wright if you are interested or would like to know more about what this role entails, or download our Trustee Role Profile, which will give you some more information about the kind of person we are looking for in a Trustee. It will also tell you more about the commitments required as part of the role. We have many incredibly valuable volunteers across the country who give their time to help us to promote the game of bridge. Some of this is through teaching bridge in schools - both primary and secondary - spreading the game to a new generation. If you would like to know more about teaching bridge to young people, visit our youth bridge pages. We also have two Advisory Groups who help us with our decision-making in certain areas of our work. Our Youth Advisory Group contributes to our work to provide bridge for young people, and our Education Advisory Group offers their time to discuss matters related to teaching and learning bridge. The latter is also supported by our team of Teacher Educators. If you would be interested in joining one of our Advisory Groups, please contact us. There are many ways that you can donate to EBED - visit our donate page for more information on how you can support us financially.